All actions according courtship like temptation, attracting mates, mating, bonding, and the like. 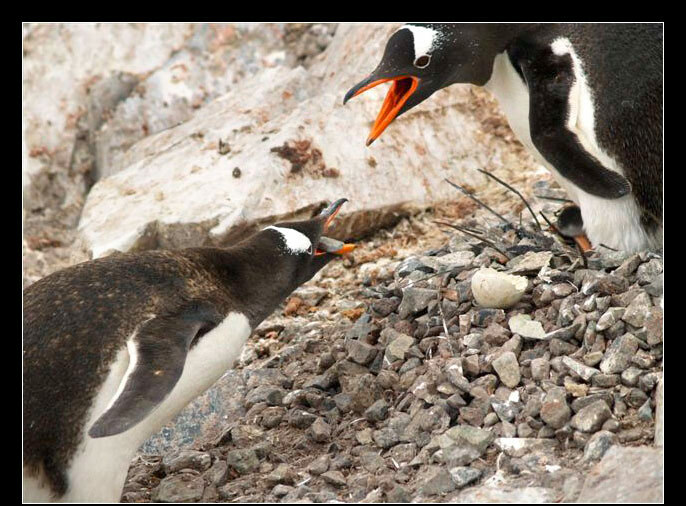 Also see breeding - engagement, while that behaviour occurs there. 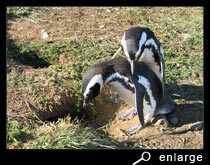 It is mostly observed in the beginning of the breeding season and near the nest. Purpose of these behaviour is to strengthen the bond between a couple. 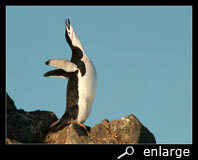 One of the most striking poses is the "ecstatic display". 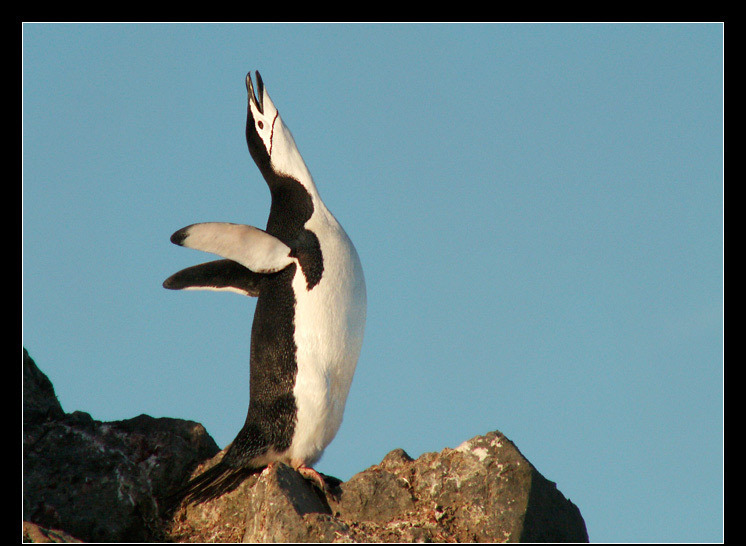 Hereby the bird raises up, pumps his chest several times, rolls his eyes, points his bill with highly stretched neck to the air, moves his flippers up and down and then calls as loud as possible. 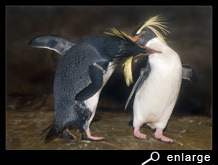 Dependent of the species, they call as follows : emperor and king penguins trumpet, while crested penguins produce a sound as a badly oiled barrow. Others call as a donkey or a monkey. 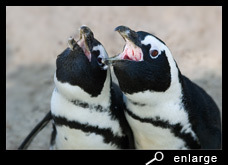 (braying sound of a humboldt penguin (mp3)) In any case it sounds for our ears as if they have an affection of the throat. But when you look at the sonogram, you will notice that each single bird has a specific voice. 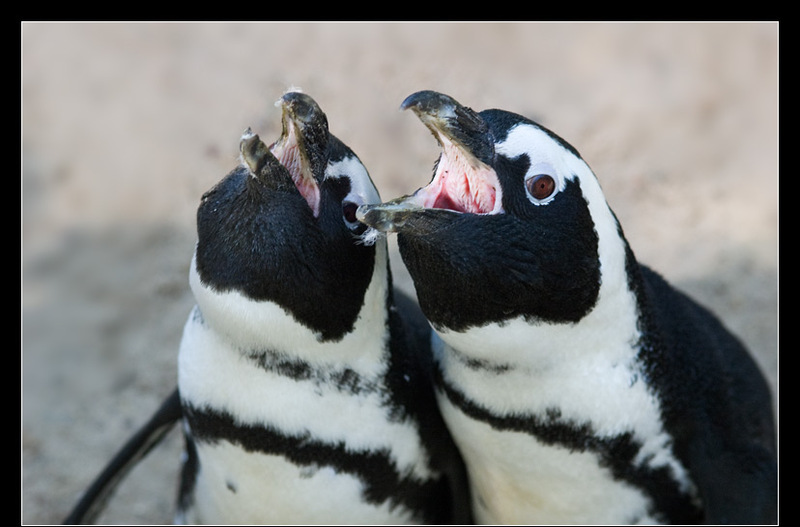 In that way, they are able to recognize and locate their partner or chick, even among thousands of others birds in the colony, when they just call loud enough and listen well. Remarkable is that in such large colonies, when one bird calls, the rest in a circle of a few metres around keeps silence, so everybody can find his partner. 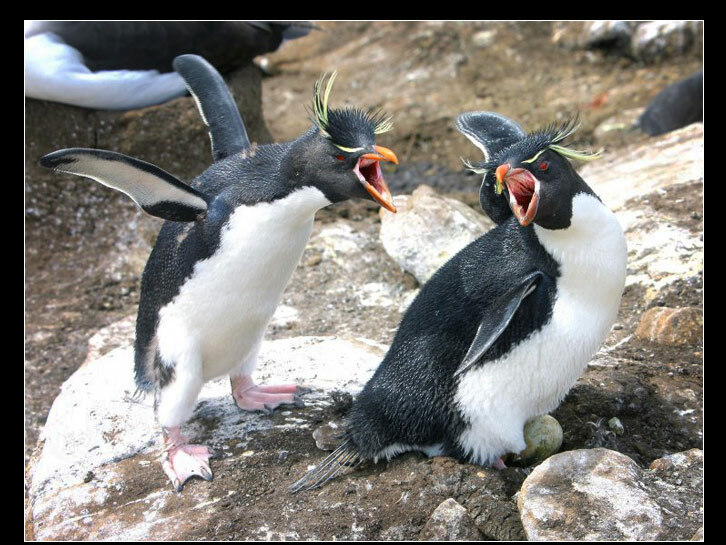 The ecstatic display is given typically by unpaired males attracting females. These ecstatic raising is also a warning for the others, that he owns that specific nest. And when a pair has found each other, they will call even louder, for a short while, as a kind of greeting(snake call). Ecstatic display can be mutual too. 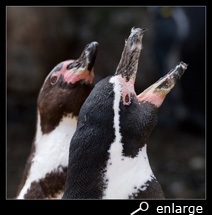 A pair raises up similar and they call or trumpet together. 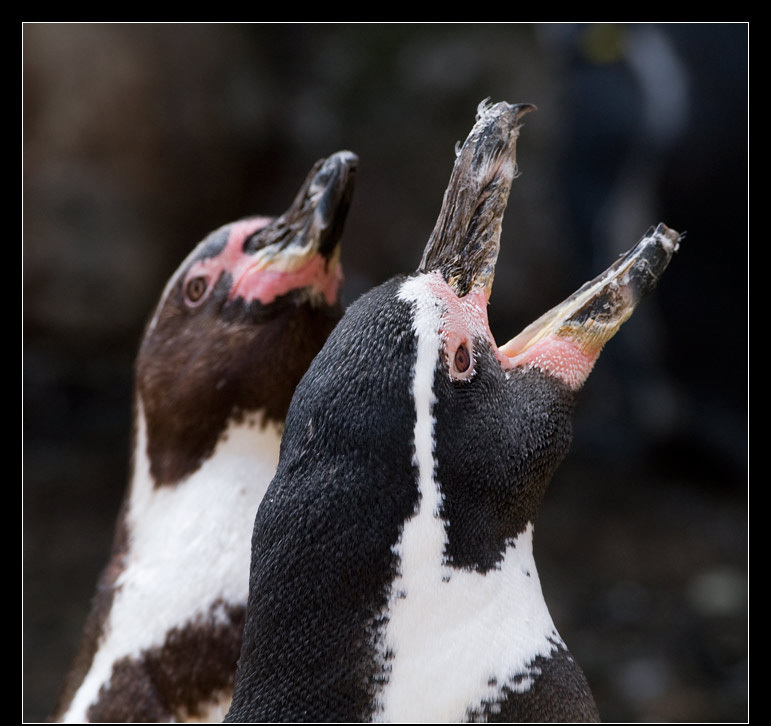 (sound of an african penguin (mp3)). At the same time they rub their heads and necks against each other. It happens a lot at the beginning of the breeding season when a pair meets and starts bonding. 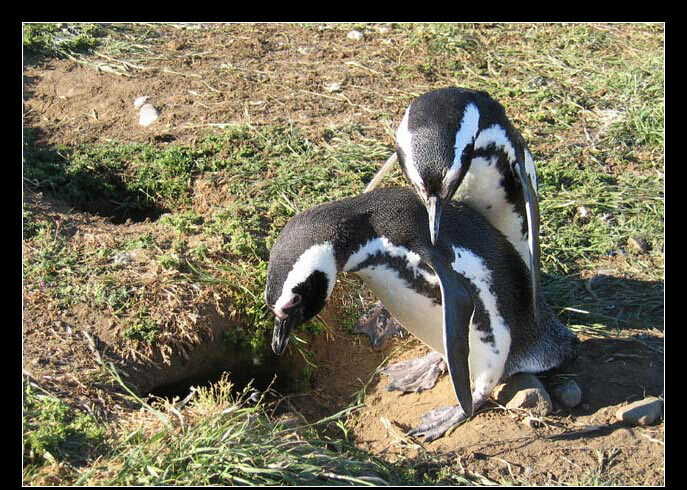 It strengthen the bond, also when a partner returns on the nest after a long absence. 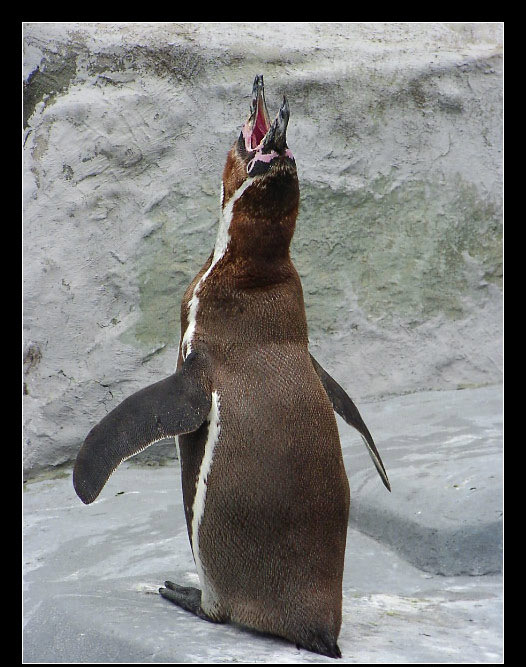 Most of the penguin species raise their head during this behaviour. 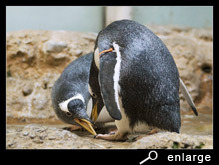 Only emperor penguins keep their face down. 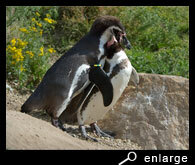 The other species either move their head up-and-down, sidewards or keep it still during the calls. 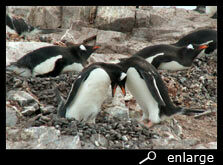 Bowing forward, face to the ground and with trembling heads these gentoo penguins are courting. 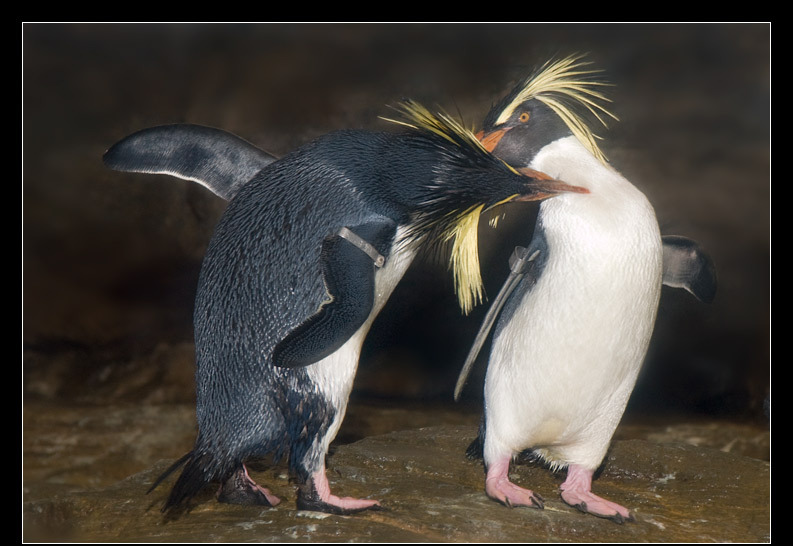 It strengthen the bond and is most demonstrated when a partner returns to the nest. 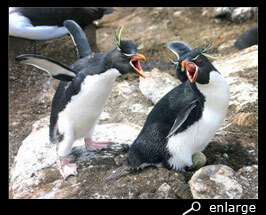 Especially species like Pygoscelis, Eudyptes and Spheniscus soorten show this behaviour at their nest. Sometimes they make a soft growling or hissing noise. 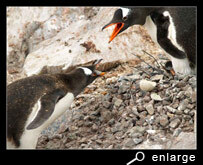 The male offering a little stone for the nest is a kind of this behaviour too, as it is usually attached to bowing. The female accepts the present and puts it to the nest. 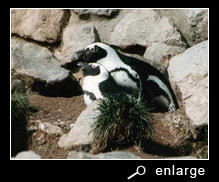 Only Pygoscelis species make a stone nest, but this offering behaviour is also seen among other species, where the male offers twigs or other nesting material. 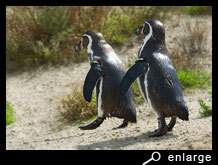 Mutual walking is shown between two partners, shortly before mating takes place. 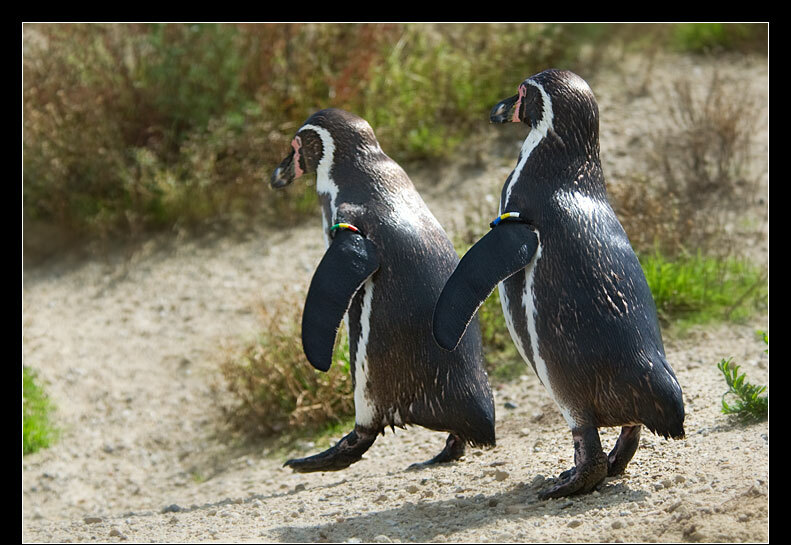 Both partners walk one after the other around the nest. 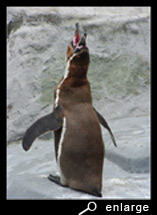 It is most demonstrated by emperor penguins, but other species practice it too from time to time. 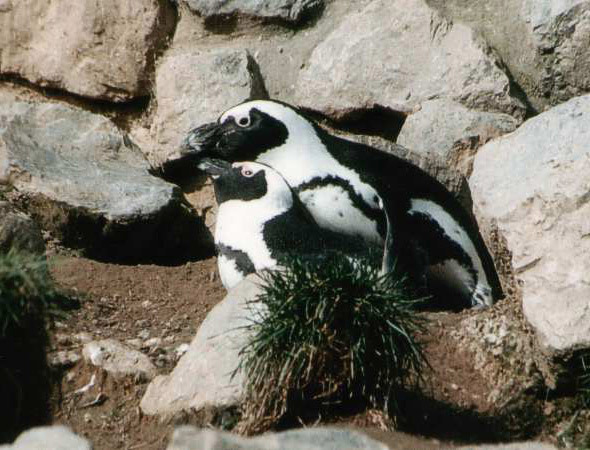 The "embrace" precede directly before mating. 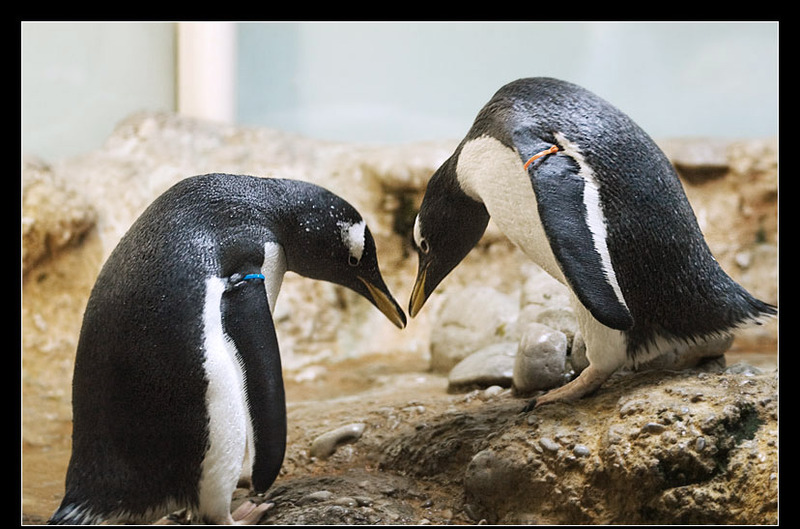 The male stands behind the female and gently strikes his flippers in her side. 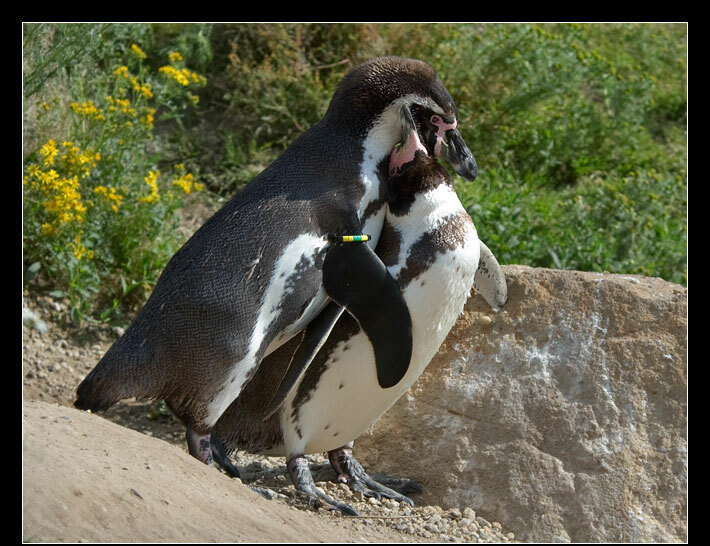 Simultaneously he leans forward and "nibbles" on the feathers in her neck. In that way he tries to tempt her to lie down for mating. Now the female allows him to go on her back. She has to hold complete still, otherwise he will fall down. As soon as he is on the right place, she puts her tail aside and they copulate. Because they really have to balance, it only lasts a few seconds. 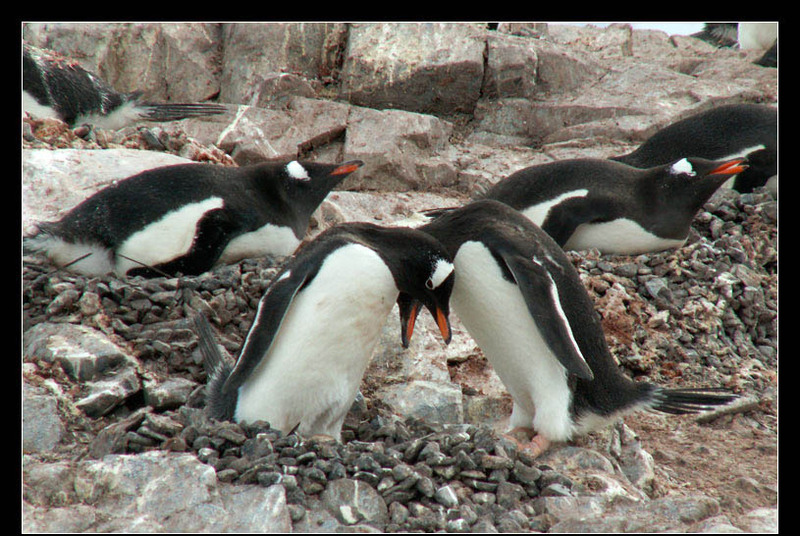 Mutual preening is also a part of the breeding behaviour. 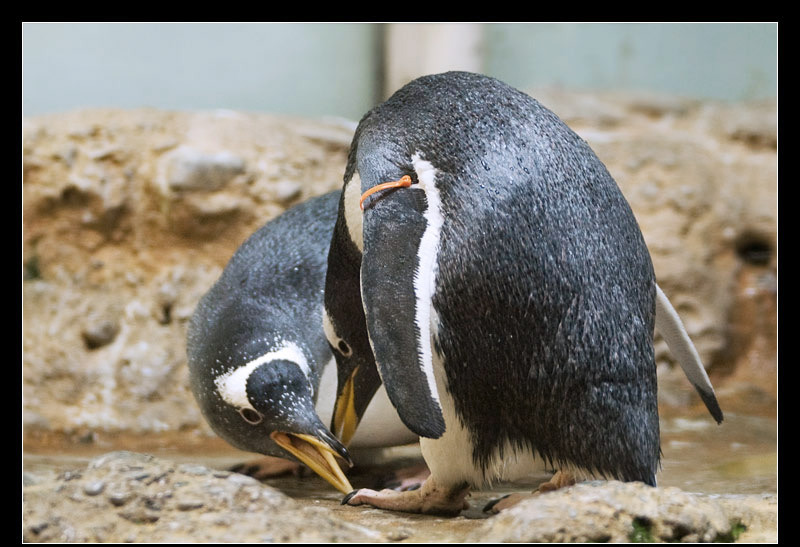 Among couples, it is a sign of love when they clean each others feathers on that parts which the other hardly can reach. It strengthen the bond of a couple. 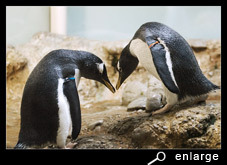 Probably it also serves as a way to reduce aggression, which instinctive arise as soon as another penguin comes closer.